Money is definitely one of the most important factor of the life and one should earn a remarkable amount of the same in order to live comfortably. But, is it worth to walk on the wrong path in order to earn that? Well, it is a debatable question and everyone have his/her unique point of view for/about the same. We personally believe that, walking on the right path may be tough but must be followed. Otherwise, it is possible that one have earned a really handsome amount of money, but lost the peace of mind. 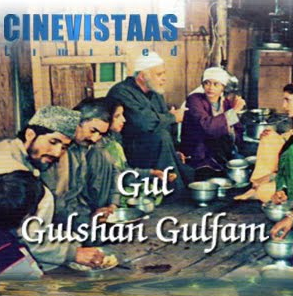 Let us continue reviewing the Magnum opus – Gul Gulshan Gulfam – the tale of three houseboats, and most importantly, the people living there OR connected with them by any means. In the morning Kadir was ready to go back to his home. He was worried as he was away all the night. He saw his friend was removing some infected apples from the tree in order to prevent the spread of infection. That small dialog tells a lot, not only about the situation at Kashmir but about the entire society. Really, witty dialogs. That is why the writing and direction of this story is considered as one of the most strong point of the same. And despite from some not so good acting (of course there are brilliant performances as well), the tele-serial was able to create an impact in viewer’s mind. When Haji Khalik asks Kadir about his act during the night, he tried prove himself innocent and genuine. Though Haji was a man with wisdom and the experience of the life, he directly asked Kadir about where he have dropped Jane. Everyone tried to explain Kadir that instead of being smart it would be better form him to accept the truth. As the relation with Jane will not only be dangerous for Kadir only, but it will affect the entire family and of course its business as well. Kadir’s wife was also upset with him, which resulted into fight between them. Narayan Lal suggests Haji to keep an eye on Kadir. Haji also suggests his eldest son to not to have “To Let” board on the board vacated by Jane, it may lead the people living in surround to have a new topic for gossiping. The second son of Kadir when went to meet Gulbeg, a businessman of apples, he saw Jane there!!! When the entire family was together, they were having conversation about the business and the Jane issue. The second son (Ahmed) of Haji, revealed what he saw today and it will be enough to make Haji worried and angry on Kadir. Kadir however keep refusing his deeds. Haji decide to inform police about the same but Ahmed asked him that it will create problem in case she drag Kadir’s name in all this stuff. Also, the soft corner was developing between Razak and Khalik’s daughter.